Broccoli is a vegetable that belongs to the cabbage family. It is a great source of vitamin C. It also has some nutrients, such as selenium, with anti-cancer properties. Research has found that eating broccoli can reduce the risk of prostate cancer and even heart disease. Broccoli can be steamed, put in the microwave or stir-fried. Boiling broccoli for five minutes and above can cause it's vital nutrients, minerals and vitamins to be lost. This then renders eating the broccoli for it's nutrients useless. It's important when eating healthy that we do not overcook the vegetables. The best ways to cook broccoli whereby you won't lose it's nutrients is either steaming, microwaving or stir-frying. Boiling it will cause it to lose it's nutrients. Other nutrients found in broccoli include Dietary Fiber, Vitamin A, Thiamin, Riboflavin, Niacin, Pantothenic acid, Vitamin B6, Folate, Vitamin E, Calcium, Iron, Magnesium, Phosphorus, Potassium, Zinc, and Selenium. We will now take a look at some broccoli nutrition facts, prepared in different ways. The percentage daily values are based on a 2,000 calorie diet. Therefore you values may be different depending on your calorie needs. Raw broccoli nutrition facts show us that it is an excellent source of vitamin C and vitamin K. Vitamin C as you may already knows amongst other things helps to boost your immune system and fight against infections that may want to attack your body. Vitamin K helps to regulate our blood pressure, amongst other things. Once again, when we look at steamed broccoli nutrition facts Vitamin C comes out tops. Vitamin C may also protect against stroke and heart disease. 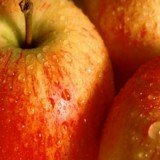 It is also a good source of the antioxidant Vitamin A and Dietary Fiber. Dietary amongst other things helps with digestion in our bodies. Chinese food is a popular favorite for many people. Nutrition facts on this chinese chicken and broccoli meal show that it's a good source of Dietary Fiber, Vitamin A, Iron, Vitamin E and Vitamin B12. It's an excellent source of protein, Vitamin C, Potassium and Vitamin B6. 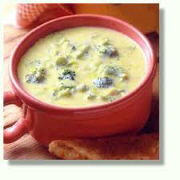 Broccoli cheese soup nutrition facts prepared with milk show that it's a good source of Calcium and a source of Iron, Potassium, Vitamin C and Dietary Fiber. The calories are fair but the sodium content is a bit on the high side. Broccoli salad nutrition facts reveal that it's not too high in calories and is a good source of Calcium, Vitamins A and C, Protein and Dietary Fiber. What really stands out though is Vitamin K which is supplied at 100% of your recommended daily allowance. Vitamin K is also helpful in aiding the process of blood clotting when there has been an injury in the body. This helps in preventing further blood loss. Cooked broccoli rabe nutrition facts show us that it has quite a number of nutrients that it's an excellent source of. These include Dietary Fiber, Vitamin A, Vitamin C, Calcium, Vitamin E, Vitamin K, Thiamin, Riboflavin, Niacin, Vitamin B6, Folate, Potassium, Phosphorus and Manganese. This is definitely something that one would want to add to their diet as it is packed with nutrients that are supplied in good amounts. Nutrition Facts on Chinese Beef and Broccoli show us that it's fairly low in calories. The sodium and cholesterol content are a bit on the high side though. However, it's a good source of Dietary Fiber, Protein, Vitamin A, Iron, Thiamin, Vitamin B6 and Magnesium. It is also an excellent source of Vitamin V, Niacin and Folate. Folate is a good nutrient to have in your diet, especially pregnancy diet. 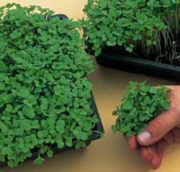 Broccoli sprouts nutrition facts reveal that they are basically just a good source of Vitamin C, and a source of dietary fiber and calcium. They also do not contain any fat, cholesterol or sodium and are low in calories. Therefore, if you want another good dose or supplier of vitamin C apart from strawberries, oranges and other citrus fruits, broccoli will also do it for you. The good thing about it is that you can also prepare it in different ways and get your dose of the important vitamins, minerals and nutrients that our bodies need.